The coast and beach, where the continents meet the ocean, are everchanging environments where the conflicting processes of erosion (wearing away) and sedimentation (building up) take place. 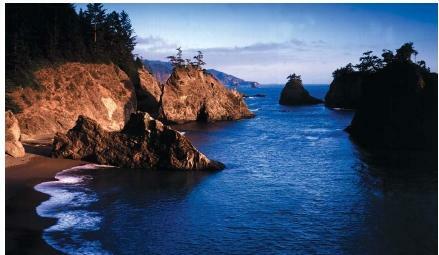 Coast is the land that borders an ocean or large body of water. Beach refers to a much smaller land region, usually just the area directly affected by wave action. Coasts are generally classified into two types: emergent and submergent. Emergent coasts are those that are formed when sea level declines. Areas that were once covered by the sea emerge and form part of the landscape. This new land area, which was once protected underwater, is now attacked by waves and eroded. If the new land is a cliff, waves may undercut it, eventually causing the top portions of the cliff to fall into the sea. When this happens, the beach is extended at its base. Along emergent coast shorelines the water level is quite shallow for some distance offshore. Much of the coast along California is emergent coast. Submergent coasts are those that are formed when sea level rises, flooding formerly exposed land areas. Valleys near coastal areas that had been carved out by rivers become estuaries, or arms of the sea that extend inland to meet the mouth of a river, for example, Chesapeake Bay in Virginia and Maryland. Hilly terrains become collections of islands, such as those off the coast of Maine. Most of the sand and other sediments making up a beach are supplied by weathered and eroded rock from the mainland that is deposited by rivers at the coast. At the beach, wave action moves massive amounts of sand. As waves approach shallow water, they slow down because of friction with the bottom. They then become steeper and finally break. It is during this slowing and breaking that sand gets transported. Emergent coast: A coast that is formed when sea level declines and is characterized by wave-cut cliffs and formerly underwater beaches. Longshore drift: Movement of sand parallel to the shore, caused by slowing and breaking waves approaching the shore at an angle. Submergent coast: A coast that is formed when sea level rises and is characterized by drowned river valleys. When a breaking wave washes up onto the beach, it does so at a slight angle, moving sand both toward and slightly down the beach. When the water sloshes back, it does so directly, without any angle. As a result, the water moves the sand along the beach in a zigzag pattern. This is called longshore drift. The magnitude and direction of longshore drift depends on the strength of the waves and the angle at which they approach, and these may vary with the season. A barrier island is a long, thin, sandy stretch of land that lies parallel to a mainland coast. Between the barrier island and the mainland is a calm, protected water body such as a lagoon or bay. If the coastline has a broad, gentle slope, strong waves and other ocean currents carry sand offshore and then deposit it, creating these islands. In the United States, most barrier islands are found along the Gulf Coast and the Atlantic Coast as far north as Long Island, New York. Sand being moved by longshore drift and being replenished on beaches by eroding highlands is a natural, constant cycle. Beaches erode, however, when humans intervene in the cycle, often by building on coastal land. Two methods used to remedy beach erosion include pumping sand onto beaches from offshore and building breakwaters away from shore to stop longshore drift.